Participants are learning about the electromagnetic spectrum as they look through diffraction slides that bend visible light unto rainbow colors. 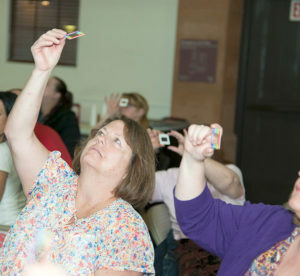 Regional teachers participated in an educator workshop to learn about the one-year study of identical twins astronaut Scott Kelly who was on the International Space Station and former astronaut Mark Kelly who remained on Earth, referring to this study as: A Stepping Stone Toward Our Journey to Mars. 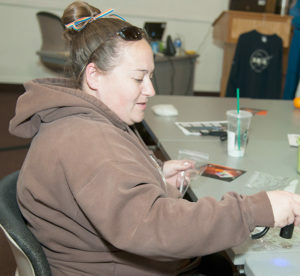 The workshop was held at the NASA Armstrong Flight Research Center’s Office of Education’s Resource Center located at the AERO Institute in Palmdale, Calif., March 2. Twenty-six educators took part in the professional development workshop that was presented by education specialist Barbara Buckner and subject matter expert, Scott Wiley, aerospace meteorologist for Jacobs Technology at NASA’s Armstrong Flight Research Center. The workshop also celebrated the return of Astronaut Scott Kelly and Cosmonaut Mikhail Kornienko from the ISS. 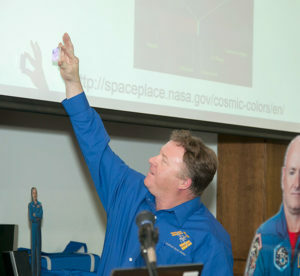 The educators learned about how living in space affects astronaut’s nutrition, radiation, solar energy, and light spectrum as well as highlighted the accomplishments of the One-Year Crew mission. Informal educator Jill Rowe uses an ultraviolent light to observe how this light causes beads that have photochromic chemicals to change color. Scott Wiley explained the dynamics of space weather including solar flares and radiation. He highlighted Armstrong’s Upper-atmospheric Space and Earth Weather eXperiment, USEWX, which uses dosimeters that monitor radiation dosing onboard Armstrong aircraft. “Radiation that is present in the upper atmosphere is harmful to humans and sensitive electronic equipment,” Wiley explained. 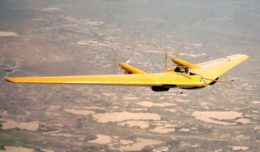 “When aircraft are flying at higher altitudes and over polar routes they are exposed to much higher radiation than the non-flying public. “Real-time, broad spectral-based radiation measurements are needed to improve both radiation forecasts and space weather observations needed to increase NASA’s scientists’ understanding for the agency’s Journey to Mars,” Wiley added. Besides learning about the effects of radiation on the human body due to living in space, participants engaged in activities that introduced proper dietary requirements of the astronauts on station through a space food demonstration. Educators also signed a “Welcome Home, Scott” return- to-Earth banner that has been sent to Astronaut Scott Kelly. Meteorologist Scott Wiley uses prism to separate visible light into the rainbow colors. This educational activity aligns to NASA education’s goal of continual support for STEM educators through the delivery of NASA education content and engagement in educator professional development opportunities.